Photo illustration shows what wireless antennae on Sampson avenue would look like. A long-anticipated proposal to build a wireless antenna on Chappaquiddick heads back to the Martha’s Vineyard Commission Thursday for the second night of a public hearing that began last week. The proposal follows nearly five years of study and sometimes heated debate in Edgartown. The MVC has received a large amount of public comment, including a dozen letters from Chappy residents, half of them in support of the project, and about half opposed. The commission is reviewing the project as a development of regional impact (DRI) since it involves a telecommunication tower higher than 35 feet. 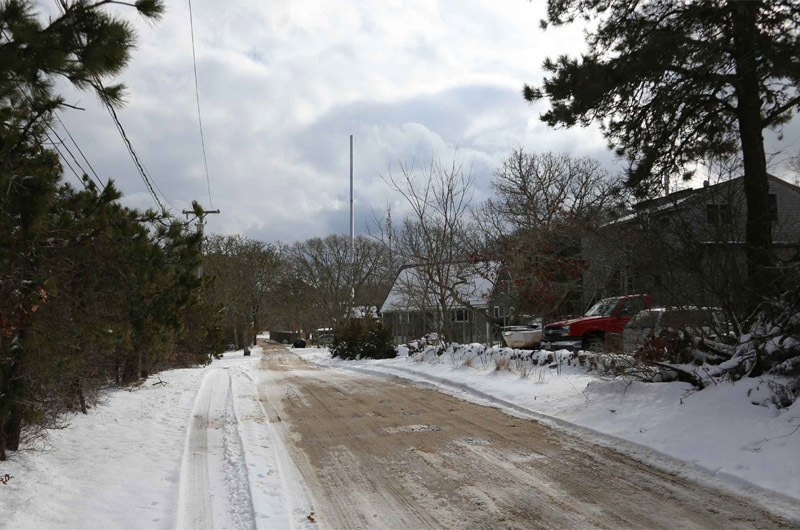 The new 104-foot antenna would stand beside an existing 84-foot antenna on the property of Robert Fynbo on Sampson avenue, just south of the Chappaquiddick fire station. It would include three guy wires anchored to blocks on the property, a 10-foot-high satellite dish and other equipment. The antenna itself, depicted as a single white pole, would be the tallest structure on Chappy. New Cingular Wireless, a subsidiary of AT&T, would expect to build a more permanent structure in the future, although the proposed antenna is designed for extended service, according to an MVC staff report. “Currently the antenna is planned for only AT&T but other providers could be accommodated,” the report states. Some, however, argue that the proposed or future equipment would not support other providers. Among other things, the commission has inquired as to what the pole might look like with more carriers, and whether the proposed structure alone could serve a longer-term need. Public concern has also focused largely on aesthetics. In a letter to the MVC last week, Molly Pickett, a resident of Sampson avenue, argued that the antenna would “stick out like a sore thumb to everyone driving or walking down the road,” and may be visible elsewhere in the neighborhood. A presentation by Advanced Engineering Group of East Providence, R.I., shows various locations on Chappy from which the tower would not be seen, although it would be visible in the surrounding neighborhood, which includes several dozen houses. Some argue that the town has not adequately explored the alternative of a distributed antenna system (DAS), which would involve a number of smaller poles scattered around the area. In a letter to the commission last week, the Vineyard Conservation Society asked that the proposal be tabled to further study that option. “If there is a chance for a win-win for both public safety and for aesthetic considerations, it is worth the effort,” the letter states. Meanwhile, supporters have cited the lengthy public process so far, and the need for better mobile communications in an area only recently wired with high-speed internet cables. Chappy residents William and Susan Geresy noted surveys that show a strong need among residents and emergency responders alike. “This proposal is a good example of planning, discussion, compromise and a smart solution,” they said in a letter. In its referral letter to the MVC in March, the Edgartown planning board called the project “vital to the safety of Chappaquiddick,” and urged its approval. The public hearing resumes Thursday at 7 p.m. at the Olde Stone Building in Oak Bluffs. If the MVC has anything to add to this other than to approve as is time for Edgartown to get out of the MVC. This tax burden institution may have out lived its usefulness. At one time it was really needed but now not so much. Most towns have plenty of there own controls. I disagree and its hardly a "burden" --- the MV Commission ensures that there is real rigor, ad analysis to decisions that have long term impacts for the Island --- enviromentally, economically, aesthetically --- I don't believe the local towns have the capacity to remain impartial --- it is very easy to have a local town become more development-intensive than others -- the MV Commission ensures there is a deeper analysis and assessment to long term advantages that keep the Vineyard being the Vineyard. I disagree, when town are try to sneak something in the back door; they can send a tax bill out, but can't seem to get the Neighborhood Notification mailed out for certain zoning districts. When they can't beat the wealthy and get what they want then it the little guy that will take the impact. Some towns need big brother (MVC) looking over their shoulder.